Not sure if this is the right spot for this. 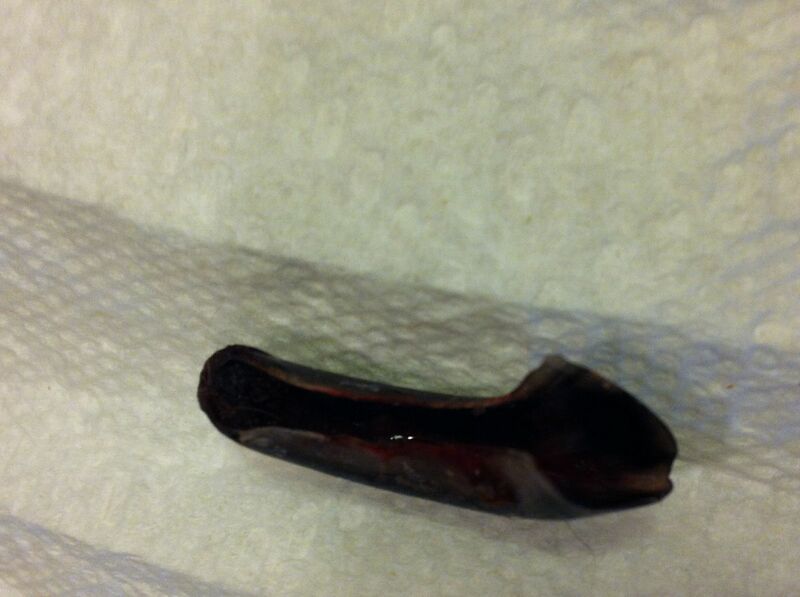 Tebo broke a piece off his nail near the nail bed about 1 month ago. 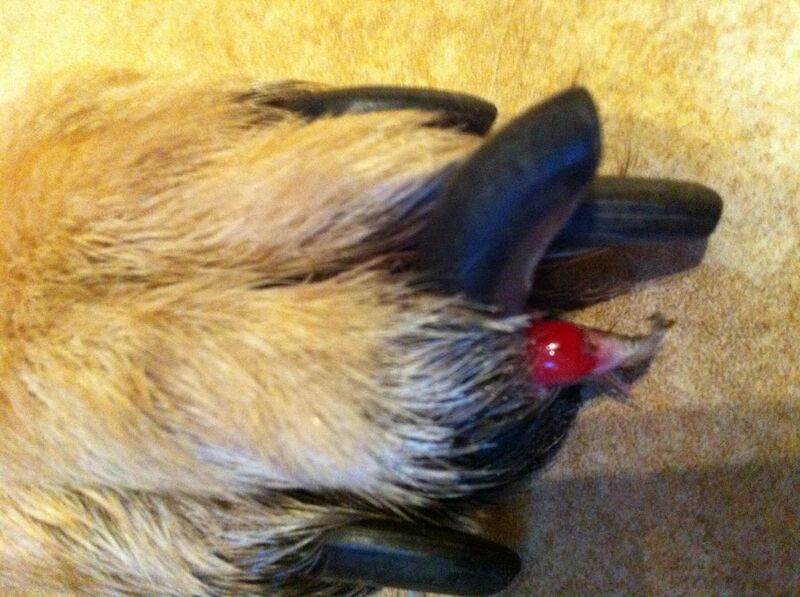 He went to the vet & she said it was an "old accident" due to the stripe visible on the nail. His nails are black & that one had a white stripe down it. It's been like that a long time, but I'm not sure how long. He got abx, pain pills & a rubber boot. So 2 days ago a whole different nail came off on the same foot! Here is a picture. All his nails have splits on the underside. Sorry for picture quality. We've been to the vet again, but what I'm wondering from you guys is. What would you do, change, add, delete to his diet to help this problem: split crumbly nails. Mikko's are also dry, crumbly,thick,hollow, but Angelo's nails are fine. They are raw fed now about 3 yrs w/ salmon oil & vitamin E.
One of my raw books says in it "Do not be tempted to supply extra calcium. By feeding plenty of bones, you have catered for your dog's calcium and other mineral needs perfectly." So I'm coming to you guys once again to help me figure this out. I'm not an expert with what supplements/vitamins/minerals are needed in this. I'm finding some conflicting advice. **Also is the whole part that's left the actual quick or is part of it new nail? I should have asked the vet, but didn't think of it till I got home. It sounds like you are doing good on the nutrition part... but the nails look... weird. Like maybe there was an infection. Maybe there is a fungal infection of some sort? Are Tebo and Mikko from the same parents? Maybe this could be hereditary for nails to fall apart. Are you keeping the nails short? If you let them grow too long, they may get old and fall apart prematurely, which would make sense why they look weird. 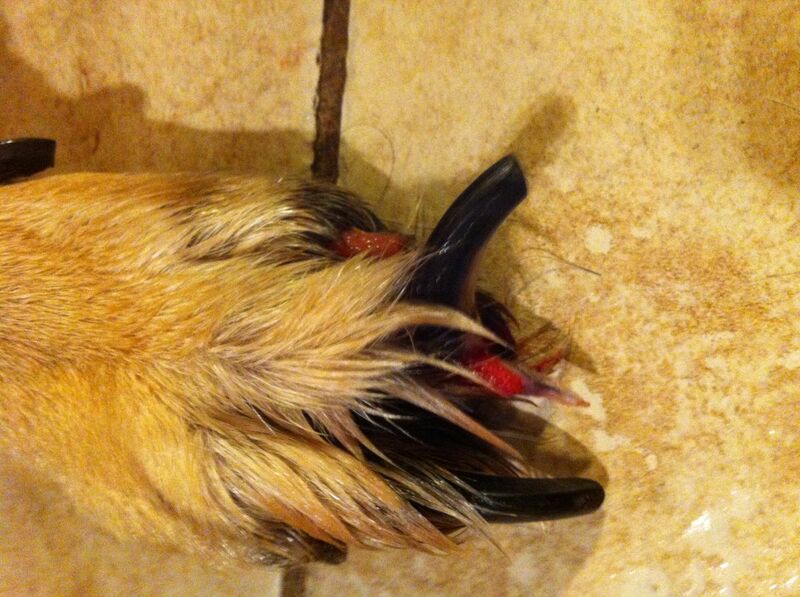 Is it possible you can show pictures of the nails that are currently on the dogs? I'm curious to see what they look like now, before they fall off. Thanks for the reply. No Tebo & Mikko aren't related. We call Mikko's nails gnarly they are awful thick,wide things. I was interested to know if raw diet could make nails grow faster, but didn't find that info. I'm not good with the pics but I'll try to get some. My old guy (I got him at 6 I think it was) came with gnarly nails. My vet diagnosed it (it has a fancier name) and we've been treating it with niacidimide, antibiotics and a vitamin capsule that has fish oil. Middle: will he be taking all that forever or is it a condition that will heal eventually? I assume he'll take the vitamin & fish oil, but will he take the niacidimide & antibiotics? Does this name--Onychorrhexis--look familiar to the fancy name? Just curious. Ouch that looks painful. I am of no help with the nutrition aspect, sorry. I think that DarkEyes has a lot of good thoughts. One more thing that I was thinking...if too many injuries occur or if there is injury to the part of the nail that grows, it can cause future growth problems. I remember one of my physio professors told me that she injured hers and from then on it never grew back the same so she needed surgery to remove the part that makes it grow. Also I know people who play soccer with the same issues. Not sure if it would translate to dogs but it's a thought. I would try the supplements too - adding to your list, as Middle said, Fish Oil at therapeutic doses, biotin, and zinc. WDJ had an article on this, but can't go looking for it right now. Last edited by MaxaLisa; 09/30/12 09:39 PM. Just an update. Since I first posted Tebo has had 4 more nails come off! One more is on it's way & several others are "seeping"/crusty at the bases. Poor guy! I feel so bad for him it is very painful. The nails are actually lifting off the quick. The vet has him on an antifungal--Fluconazole & of course pain pills. She is also consulting a specialist trying to get more info. Also I have him on the supplements multivitamin (450mg Ca), salmon oil, Vit E, biotin & eggs with his meals. Cross your fingers they can figure something out that helps his poor toes! If you don't agree with me ... you are just not listening well enough. 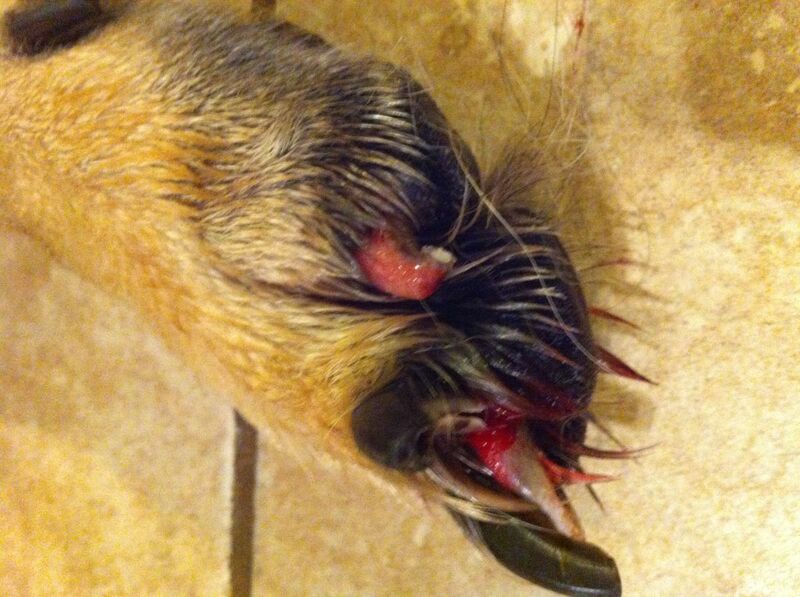 Well, the dermatologist/vets that my vet consulted wanted her to amputate his toe. She's not happy with that advice. Still hoping she can find someone who has an idea. They do think it is Pemphigis or one said DLE. Does anyone know anyone who has ever treated DLE or Pemphigis? He's now lost 7 nails, in pain & is walking so tenderly my poor guy. Just an update. 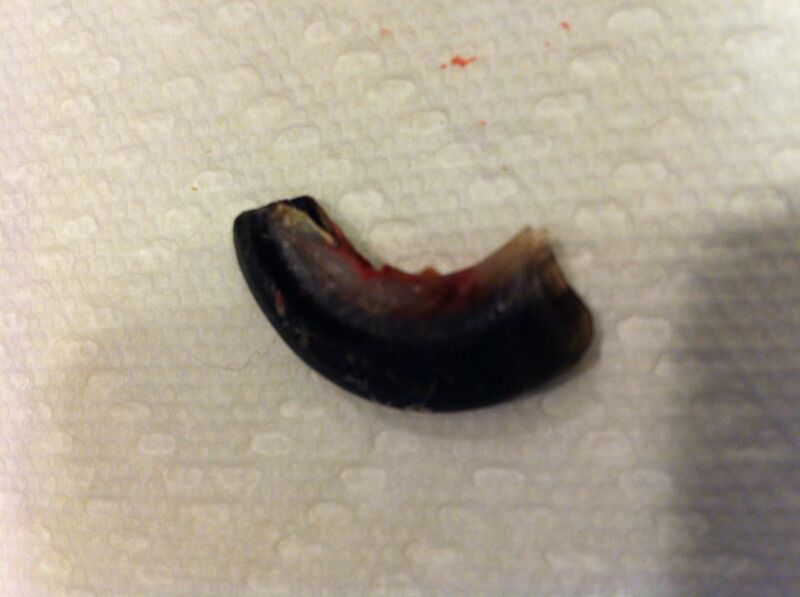 Since I first posted Tebo has had 4 more nails come off! One more is on it's way & several others are "seeping"/crusty at the bases. If this is affecting more than one nail, amputating the one makes no sense. This actually sounds like SLO, which happens in GSDs, is controlled with supplements and a doxycycline/niacinamide protocol. 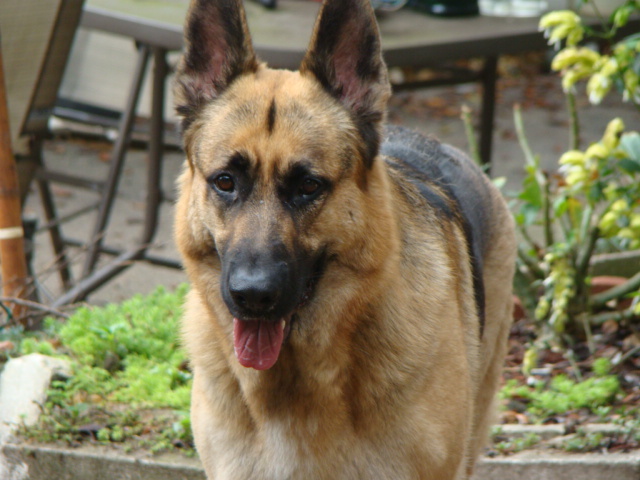 Middle has a dog with this, can't think of the name, will have to look for links, etc., later. Yes, SLO. Symmetrical Lupoid Onychodystrophy like Lisa said. No amputations, so that's good. Actually if your vet VINs (Veterinary Info Network that they can be a part of) it there is a nice treatment protocol. 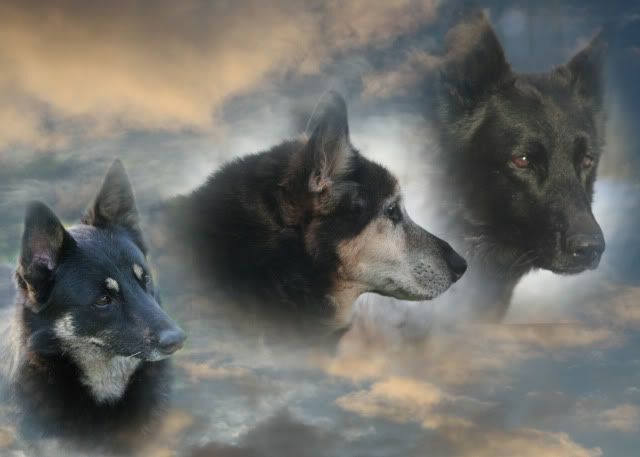 My vet got it from there for me when Amy's Bear (beautiful black GSD girl) had it. Oy. Glad your vet wasn't big on that info back! 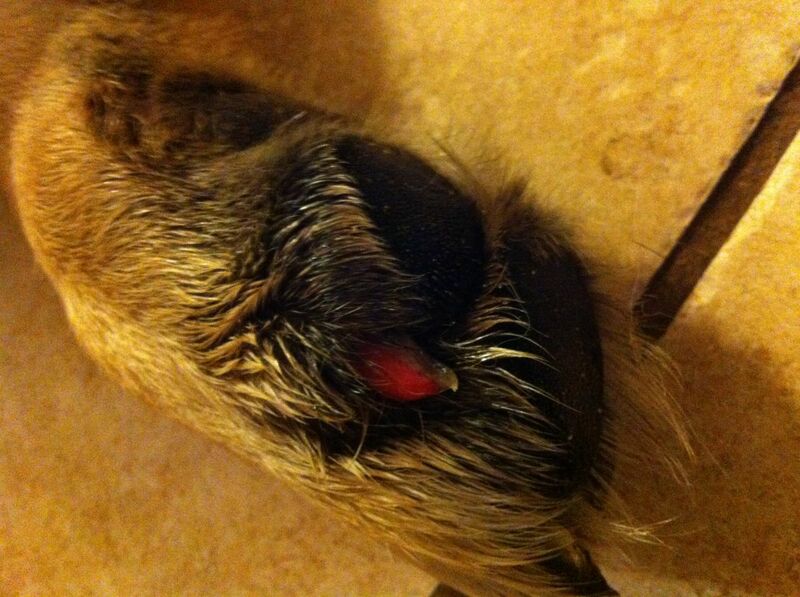 My friend has a greyhound with SLO...she gives niacinamide and fish oil supplements but as it is an auto immune disorder, there are still flare-ups where the nails just rip out. And they look horrible cracking and so weakened. She puts booties on her dog when outside in the winter so the feet are less irritated from the ice/snow. Yes, that's exactly the disease I was thinking of, and thanks for the link jean! Kinda sad that the vets miss this, but I think it's fairly rare, though we've seen several between the two forums. First thank you so much for the feedback & links they were SO helpful & easy to see YES that's exactly what it is. 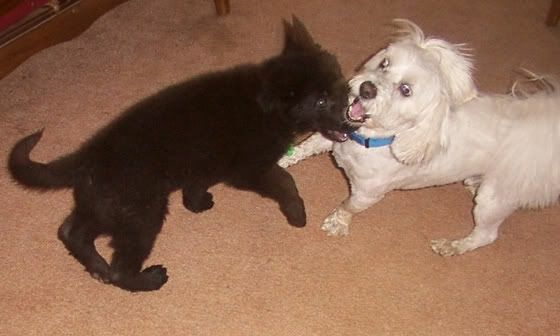 I didn't understand when I was told "form of lupus" & nothing that I looked up matched with his symptoms, The links I looked up only talked about sores, hair coming off muzzle & depigmentation--which he doesn't have any signs of. All the people she talked to especially University of Florida wanted the toe! Anyway I get it now. Armed with printed info from the sites, I went to vet this am to talk more with her. She's on the same pg as this (SLO) just didn't say the name of it on the phone so I got concerned we still didn't know what we were dealing with even after consults. I'm currently dealing with a crisis & also admit to not having the clearest head right now, but just wanted some relief for this poor guy! Now he's got his medicine, I thank you all for your help & input! I swear I say it all the time this place has the best resources anywhere--you guys, well girls. I hope this dog also gets on the supplements, they are important. Yes I also have him on the supplements too. Thanks Lisa. Just in case anyone ever comes across this stupid disease. I'll post a couple pictures. This is absolutely awful. It's so painful. Tebo was a very active boy, he went from bursting out the back door running nonstop to limping very tenderly to the door (1 day recently he wouldn't even walk). Here you can see why. The nails lift straight up. Like if you put the hood up on your car. Then they usually hang on 1 or 2 days. Notice the angle of the outer nail? See the long skinny thing under the lifted nail! He's on 10 1000mg fish oil caps a day, 2 400IU vitamin E, Biotin, multvitamin, Pentoxyphylline, Fluconozole & Tramadol. I had always given salmon oil & vit E, but I've switched to the fish oil caps, since I couldn't figure the exact dosage of EPA on the liquid Grizzly Salmon Oil it said 9% EPA(?). The EPA dose I have him on is 180mg/10# of dog. I am very thankful this dog has a strong stomach. He's always been an "adventurous eater" he will even take those fish oil caps & eat them. Although I usually give them in his food (under chicken skin or in hamburger) but they've fallen out & he will just pick them up & eat them. I think that's really cool. I'd hate to have to shove all those pills down his throat. 11 nails off at this point, 3 more in various stages of lifting & a crusty dew claw, so I'm assuming that's going to go to? We go Thurs. for a recheck. I hope that after he is on the protocol for awhile, things will get better. If he doesn't improve soon, I would add the doxycycline/niacinamide to the protocol. Darn it, so not fair.